Home » French Government » Have You Seen Paris’s Coat of Arms? Chances are that most visitors to the City of Light have no idea that they’ve spotted the official emblem of Paris countless times. 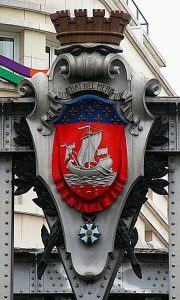 Paris’s coat of arms appears on well more than 100 buildings and other structures throughout the city. 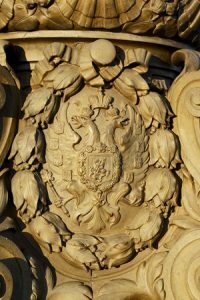 The reason you likely didn’t recognize the coat of arms is primarily because its main image is that of an ancient merchant sailing ship—not something that most people would associate with France’s capital. The vessel represents the Marchands de l’Eau, a Middle Ages organization of merchants (the term literally means “water merchants”) that was organized in 1170 to control all trade conducted on the Seine River. And while the jurisdiction of the organization was supposed to be limited to only commerce, the Marchands de l’Eau grew so powerful that it expanded its scope into politics and organized a city government as an entity mostly outside the reach of the French crown. 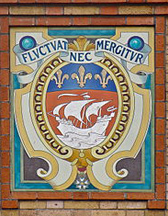 The group also elected its own city leader, the Provost of Paris, and selected the image of a merchant ship at sea and the motto Fluctuat Nec Mergitur, a Latin phrase that translates to “tossed by the waves, but does not sink,” for the city’s coat of arms. Paris was run by the provost and a council of aldermen until 1383 when an uprising (one of many throughout France that year) forced the Marchands de l’Eau to disband. The trade organization never regrouped, but the City of Paris’s coat of arms retained the merchant ship imagery. Another recognizable symbol on the coat of arms is the fleur de lis, a stylized symbol of the lily (fleur de lis is French for lily flower) that for centuries has had religious and political connotations throughout Europe, but especially in France. And although the symbol was strongly linked with France’s monarchy up until the late 18th century, historians say it is actually representative of all the social classes of the Middle Ages. Each “petal” in the flower reportedly symbolizes a particular group—the peasants who worked, the soldiers who fought, and those who prayed, including the clergy, nobles and royals. The fleur de lis today remains an enduring symbol of France and appears on the coat of arms of nearly two dozen French cities, including five of the six largest municipalities in France. It also served for centuries as the official symbol for the Ile de France, the region of the nation that includes Paris and its suburbs, up until the French Revolution. For a brief period during and just after the French Revolution, all city coats of arms were banned in the nation. 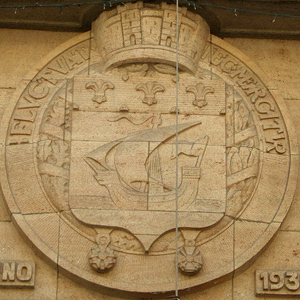 However, Napoleon in 1811 (21 years after the ban was implemented) agreed to let French cities once again choose and display official emblems and coats of arms, and Paris quickly re-adopted its former coat of arms that includes the sea vessel, the fleur de lis and the Latin sailing motto. It has remained the official symbol of the City of Light ever since. Visitors to Paris can see the coat of arms on well more than 100 buildings throughout the city, including the Hotel de Ville (Paris’s city hall), town halls (called mairies) in each of Paris’s 20 districts, most buildings housing city offices and local services, all major train stations, many primary and secondary schools and all city police offices. This entry was posted in French Government, French history, History of Paris, Sight-seeing and tagged coat of arms, fleur de lis, Marchands de l'Eau by Bob Adams. Bookmark the permalink.